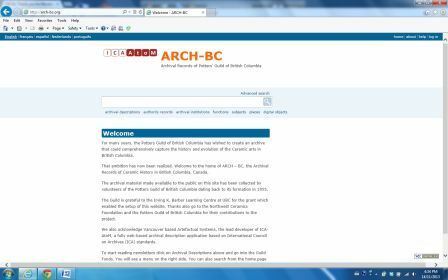 Check out ARCH-BC, a database developed by the Potters Guild of British Columbia (PGBC). It is an invaluable resource not only for the history of BC pottery but also for the documenting of potters from across Canada and from around the world who taught, demonstrated or visited the province. PGBC documents going back to the 1960s have been archived and digitized for retrieval by anyone. Kudos to the Guild. They are light years ahead of so many other regions in preserving their ceramic history. A key driver in this project is Debra Sloan of the Guild, one of the most helpful and informed people in the business. This entry was posted in Archives, British Columbia, Ceramics, Newsletter, Potter's Guild/Association, Pottery, Studio Ceramics Canada and tagged archives, British Columbia, database, guild, newsletter on November 17, 2013 by Barry Morrison.